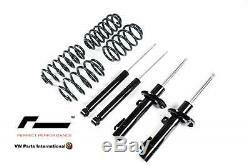 VW Golf MK5 VWR Sport Shock Absorber & Spring Kit Volkswagen Racing RacingLine. Brand New 100% Genuine RacingLine Part, the best there is designed for track, built for road. Race Designed & Developed, Made by RacingLine Performance, best known for delivering the Volkswagen Racing motorsport programme since 1997, out of which was born the increasingly popular Motorsport & Performance Parts range, with all Race parts heavily Race designed, developed & tested, treat your pride and joy to the best there is with RacingLine Performance Parts. When it comes to Sport Dampers & Springs at an affordable price, the compromise between performance and comfort has been a persistent dilemma for keen drivers and enthusiasts. With the RacingLine Performance Sport Suspension kit, which consists of two front and two rear Tri-Valve Dampers & Matching VWR Sport Springs, this dilemma becomes a thing of the past for Golf 5, 6, Scirocco and the other VAG cars on the A5-platform at an affordable price. The VWR Sport Shock Absorber & Spring Kit is supplied as 4 dampers with springs. Although the standard springs can be retained for this kit for those who want to retain standard ride height, it has been designed from the outset to work in harmony with VWR Sport Springs. This kit is compatible with cars fitted with Volkswagen Group's switchable ACC suspension although it's important to be clear that the dampers lose the switchability of the standard dampers, and an additional electronic box is required at extra cost to avoid fault codes in the car, Please message for details. This kit will fit vehicles with a 55mm Front Strut only. MOTORSPORT QUALITY Bringing together all of VWR's motorsport suspension expertise gives a high quality, fast-road orientated damper kit employing sophisticated valving inside the dampers for optimum wheel-control. PERFECTLY MATCHED The shock absorbers have a precisely matched damping curve to the VWR Sport Spring rate or to the original factory springs. TRI-VALVE TECHNOLOGY Ensures suitability of dampers for both standard and lowered cars, as well as a sporty feel during high speed cornering on smooth surfaces and comfort on uneven surfaces. NO DAMPER FADE The addition of Nitrogen gas into the system eliminates oil foaming when the oil is hot, the main cause of shock fade. VWR's superior Tri-Valve design controls and limits the heat build-up internally ensuring the oil lasts longer. DUAL TUBE DESIGN Comfort guaranteed thanks to dual tube design and low pressure Nitrogen gas system. HIGH QUALITY OIL Longevity far exceeds OEM spec and many rival aftermarket dampers of similar value due to the higher quality oil used in the VWR Sport Dampers. VWR Sport Damper features three hydraulic valves: one bump valve, one rebound valve and a main valve, with the movement of the damper shaft predominantly controlled by the valves in low and high speed shaft frequencies (smooth and rough road conditions). The bump valve is mainly responsible for the sporty, agile feel of the car on smoother surfaces, whilst the rebound valve maintains the comfort balance. Through extensive testing of damping rates, our engineers have established what we consider to be the ideal settings for enthusiastic driving. The VWR Sport Damper kit is aimed at fast road use, yet has been developed carefully to ensure that the comfort is not sacrificed - in fact, it is the beautiful, taut ride quality that most customers are most impressed by when they try the Sport Damper Kit. Unforgiving bumps in the road which cause other damper kits to react harshly are controlled by the main valve which overrides the bump and rebound valve. It smooths out the reaction of the damper shaft at high speeds to maintain comfort. This intelligent Tri-Valve technology is what sets VWR Sports Dampers apart from standard OEM dampers. It allows you to have the best of both worlds. RacingLine Performance engineers have worked tirelessly to achieve this optimum balance between performance and comfort by using the most sophisticated testing equipment and procedures. A shock dyno was used to extensively simulate the performance of the damper in a variety of situations, from the race track to the road, to confirm endurance and reliability. The body and brackets of the Sport Dampers are made of mild steel and the damper shaft features a hardened chrome finish. The dampers are finished in a black gloss paint with the RacingLine Performance logo applied. VWR Dampers are supplied with a mounting nut for the top of the component, and bespoke to this kit is a Teflon disc which attaches to the damper shaft to prevent the bump stop from sucking oil from the top shaft seal. This is a feature which has been overlooked by most other damper designs in the market and it is one of the key reasons why RacingLine Performance Sport Dampers perform optimally on a consistent basis. How do VWR achieve this? All of their testing is done using high-cost multi-way adjustable dampers and both VWR Sport Spring and the original factory spring combinations. Only once VWR have finished their set up do they then'lock' the settings. The profiles of these development dampers are then fully measured on a damper dyno, and the results replicated exactly into the valving of the Sport dampers. This kit is compatible with cars fitted with Volkswagen Group's switchable ACC suspension although it's important to be clear that the dampers loose the switchability of the standard dampers, and an additional electronic box is required at extra cost to avoid fault codes in the car, Please message for details. If you haven't yet given your Golf MK5 the VWR/RacingLine treatment, don't delay, get the best there is! See the shop for 1000s more Performance VWR Parts. Get news of New Parts to your inbox. 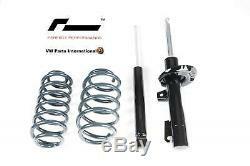 VW Golf MK5 GTI R32 RacingLine VWR Sport Shock Absorber & Spring Kit VWR Racing. Choosing the right Air Lift Kit. All other Non VW Parts. VW Golf MK5 VWR Sport Shock Absorber & Spring Suspension Kit Volkswagen Racing RacingLine. Please check this listing page carefully as the answer is usually there. Of course it could be cancelled if after the conversation, it turns out not to be a suitable part/product for you. For 1000s more of the best available parts. Made with in Great Britain. Template Managed & Developed by Dev VIP. The item "VW Golf MK5 GTI R32 RacingLine VWR Sport Shock Absorber & Spring Kit VWR Racing" is in sale since Saturday, April 2, 2016. This item is in the category "Vehicle Parts & Accessories\Car Tuning & Styling\Performance Suspension\Performance Suspension Kits". The seller is "vw-parts-international" and is located in UK. This item can be shipped worldwide.